You may as well call us the Tower of Babel, because at any given moment, there are at least three languages thriving in my apartment. Spanish, Italian, English; and sometimes all three mixed together in what we like to call Monicasolani, thusly named for its main employer, my roommate. I am the only North American in the apartment, a lone American among two Italians and one Spaniard. When we sit down to eat, it’s like a meeting of the UN, a fact that brings us great joy. Raul helps us with Spanish, Monica and Francesca teach us how to swear in Italian, and I provide confusing phrasal verbs and stimulating insight into the American university life. 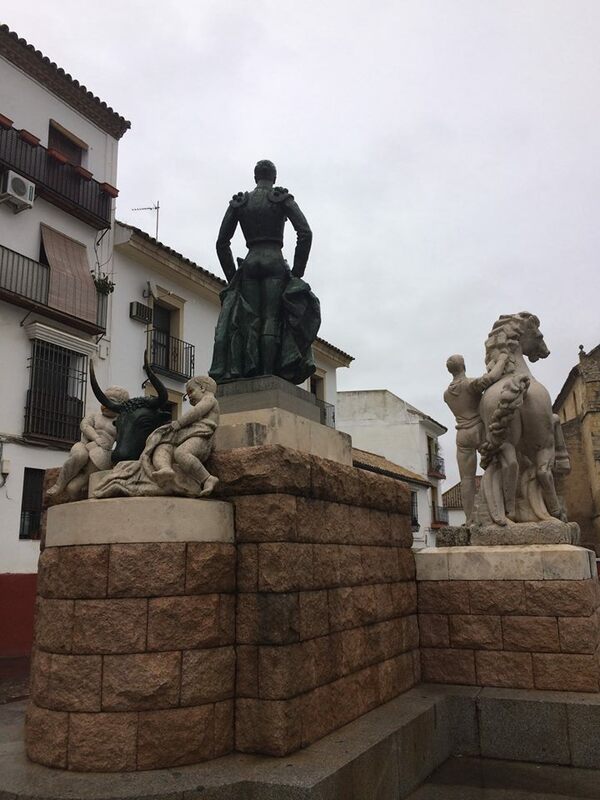 We live in the northern part of Córdoba in the neighborhood of Santa Marina, also known as “The Bullfighters’ Neighborhood.” Which makes sense considering Manolete, a famous torero, has his statue and accompanying plaza just around the corner from our house. Every day on my walk home, I am greeted by the sight of his very sculpted derriere which is unfortunately right at eye level so there’s just no avoiding it. After I pass Manolete’s bronze backside, Santa Marina appears before me—Santa Marina, a beautiful church that is significantly older than my country of birth. Our apartment sits right on the edge of a plaza dotted with orange trees, four benches and a fountain that doesn’t work. My two windows look down on the plaza and out at the magnificent bell tower. You know what the worst part of a bell tower is? They’ll ring on the hour, but not every hour; yet they seem to ring every half hour. At noon, they go insane. Most inexplicably, around 6:15 on no day in particular, the bells will commence inharmoniously and continue for much longer that could possibly be necessary. On Sundays, forget about it. Don’t even bother trying to sleep past 11 because once Mass lets out, you had better be ready to greet the day. Sometimes I wonder who rings the bell, especially at 6 o’ clock in the morning. Is it just that they don’t get paid enough, or do they actually derive some kind of sick pleasure at simultaneously tormenting and confusing us? Besides the, ahem, musical amenities to my apartment, I have a rather large room which I had decorated before I even finished fully unpacking. It’s incredibly cozy and feels like home; yet also distinctly Spanish with the complementary Mary-and-Jesus-image hanging lovingly above my bed. Soon to be featured on Expat PB Teen! As you can see, my passionate love for colors, hanging things, and string lights has not subsided. However, I must say that searching for string lights nearly became my White Whale as I realized that “christmas lights” weren’t really a thing people hung up in their houses in Spain, or outside of them for that matter. The best I could do was ask storeowners for “lanterns,” to which they would look at me with a baffled expression and then bring me to the flashlight section. I was saved by a Danish tchotchke store called Tiger, which sells everything from cat shaped door-insulation pillows to gourmet cooking spices (and, coincidentally, string lights). The House of Three Languages is indeed a palace of learning, relaxing, budget-feasting, and good-natured insulting. Bells, lack of dishwasher, and the fact that when people loudly walk their dogs late at night and it echoes of the walls aside, I am most pleased to have a lovely home and great roommates to rule over the plaza with me. Previous Post ¡Que tengas un día delicioso! I feel you on the international lifestyle. My house has ten residents, representing six different countries — USA, Mexico, Italy, Germany, France, and Slovakia — and more native languages than you can shake a stick at! It causes issues from time to time — like when the fire alarm is going off and the user guide is written in English but the people who arrive to fix it speak French (Happy Monday!!) — but I’m kinda loving it.